The public remains deeply dissatisfied with the way things are going in the country. Just 26% are satisfied with national conditions, while 71% are dissatisfied. And Americans have muted expectations for the year to come: 49% say they think 2015 will be a better year than 2014, while 42% think it will be worse, according to a survey conducted earlier this month. The current ratings are more pessimistic than in recent years, as the public generally takes an optimistic view of the year to come. A year ago, 56% thought 2014 would be a better year than the last, compared with fewer (35%) who thought it would be worse. 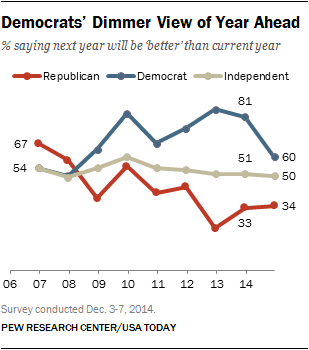 The more negative expectations for 2015 are driven in large part by a shift in views among Democrats. With the Republican Party having gained full control of Congress, 60% of Democrats expect 2015 to be better than 2014 — a drop of 21 points from a year ago when 81% thought 2014 would be better than 2013. Nonetheless, views among Democrats are brighter than those of Republicans: just 34% of Republicans expect the coming year to be better than the last, little changed from prospective views of 2014 (33% better). In December 2012, following Barack Obama’s reelection, just 22% of Republicans thought 2013 would be a better year than 2012.